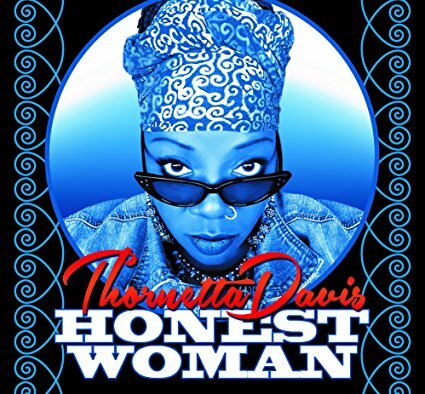 Crowned the “Queen of Detroit Blues” in 2015, Thornetta Davis is a blues singer and songwriter with a big voice and a passion for all things blues, rock, and soul. Though she’s worked with labels like Sub Pop in the past, her latest release Honest Woman is a self-released project full of passion. Honest Woman starts rather untraditionally, with Felicia Davis singing her sister’s praises like a spoken word poem over back porch Delta blues: “When my sister sings the blues, she moves her hips swaying to the beat / Snapping her fingers and stomping her feet.” She compares her sister to Bessie Smith and Sippie Wallace, two of the most famous black blues singers from the 1920s. 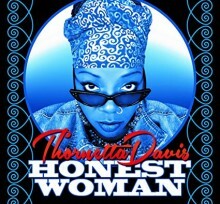 This celebration of black women in music and the blues reverberates throughout the entire album, as Thornetta Davis draws inspiration from artists such as Denise LaSalle, Etta James, Sarah Vaughn, and Big Mama Thornton. Etta James sang the blues. Davis’ mixture of black music genres stands out particularly on “Set Me Free,” a modern funk and blues spiritual featuring the Larry McCray Band. Though it may be easy to view the raunchy aspects of blues as the opposite of gospel, Davis’ plea for the Lord to come down and set her free pairs perfectly with the blues singer’s themes of struggles and the pain of working. Today, jazz musicians drift into Americana music with ease and frequency. 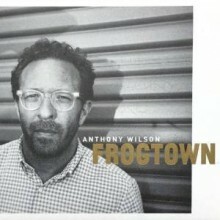 Anthony Wilson is the latest jazz guitarist to take the plunge into Americana with his superb release, Frogtown. The album’s name is taken from the Frogtown neighborhood in Central Los Angeles, also known as the Elysian Valley. Frogtown’s population of 8,000 is predominately middle-class Latinos and Asians, who, recently, have resisted gentrification through community organizing. Wilson does little to connect the album’s thirteen songs back to this neighborhood in an explicit fashion, but the musical quality of Frogtown is what merits attention. In this jazz/Americana context, Wilson’s guitar expertise and songwriting talents go hand-in-hand. Frogtown’s title track—destined to appear on a public radio program somewhere—is as catchy-as-they-come and features deceptively lush orchestration. “The Geranium” is a moody jazz tune, whose melody recalls Wes Montgomery’s “Bock to Bock.” This reminds us that Anthony Wilson is no stranger to the jazz canon: his father, Gerald Wilson, was a jazz trumpeter, big band leader, and arranger in Los Angeles whose career began in the 1930s. A surprise on the album is Wilson’s singing. To date, Wilson has crafted his musical identity as a supporting guitarist with jazz/pop musicians like Diana Krall, Al Jarreau, and Paul McCartney. Yet, on Frogtown, Wilson’s voice takes center stage. “I Saw It Through the Skylight” is a spry vocal performance—he sings as if he has just found love all over again. On “Shabby Bird,” Wilson makes the best of his limited range, with a harmonized vocal line that is clean and understated. In its convincing drift from jazz to Americana, Frogtown is a solid release that shows Anthony Wilson to be as multi-faceted as the neighborhood for which his album is named. 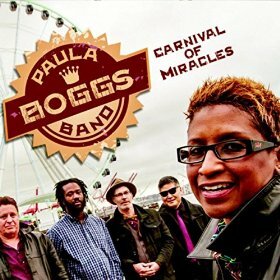 Carnival of Miracles (2015) is the latest album from Seattle’s Paula Boggs Band. At its core, the album serves as an emotional outlet for Boggs as she confronts the loss of loved ones and as she experiences the transition from a professional career to a full-time musician—Boggs quit her job as an attorney and as an executive for Starbucks to follow her passion. Carnival of Miracles is introspective and somber in its reflection of the pain. Yet, underlying the pain is an uplifting message of hope and perseverance. At the forefront of these complex emotions are Boggs’s intelligent and poetic lyrics. By featuring the claw-hammer banjo, lap-steel guitar, accordion, and haunting melodies, the album is rooted in an eclectic Americana sound. Carnival of Miracles opens with “Grateful,” a country-styled song intended as an ode to Boggs’s lover. As the song progresses, the delicate melodies of the banjo and accordion tenderly wrap around each other creating a musical metaphor for the song’s characters. As the words “You have saved me” are repeated in the chorus, it becomes clear that Boggs is not only singing about the joys of love but the pain that love allowed her to leave behind. The album’s title track is also gentle and introspective. Here, Boggs sings of her own struggles to find happiness in the wake of personal tragedy. Her voice, deep and dark, conveys both the anguish she currently feels and the solace she hopes to find. She sings, “We dance to mask our mourning and lift our souls” before adding the encouraging proclamation that “together we make the most of this great land.” Again, the accordion and the banjo are highlights of the song. For track five, “Look Straight Ahead,” driving solos on the electric guitar replace the soft melodies of the claw-hammer banjo and accordion found in previous tracks. The change in instrumentation makes this the grittiest, most rock-oriented song on the album. “Look Straight Ahead” is also the most empowering of the album, as Boggs casts off the role of victim and takes up the mantle of the fearless fighter. “Lenny’s in the House,” the seventh track, is a fun-filled and quick-tempo country song honoring the great songwriter and musician Leonard Cohen. While the song stands in stark-contrast to the somber tone of the album’s earlier tracks, it is no less introspective and personal. Boggs is clearly inspired by Cohen and her debt to him is one she does not take lightly. Although “Lenny’s in the House” fills Boggs’s audience with the desire to dance, it also encourages reflection on and celebration of similarly inspirational people in our own lives. Carnival of Miracles closes with a cover of Neil Young’s “When You Dance I Can Really Love” from his 1970 album After the Goldrush. Again, it is the banjo, accordion, and lap-steel guitar that are at center of the song. Although Boggs and her band perform this classic rock song as a modern country song, the transition of style feels appropriate. A highlight of the song is the use of a large “choir” at the end of the song. This “choir,” which is formed by layering Boggs’s voice on top of itself, not only increases the emotional impact of the song but shows off Boggs’s talent as a vocalist. Carnival of Miracles is produced by Grammy award winner Trina Shoemaker and is the follow-up to Paula Boggs Band’s 2010 debut album, A Buddha State of Mind. The Paula Boggs Band is currently on tour across America.